The P&T colony, within the second stage of the posh locality of Hanuman nagar is a nightmare for the residents as the open drains have turned into potential breeding ground for life threatening mosquitos and bacteria and insects, thanks to continuing leakages of sewage into the open and long neglected drains. Neither the concerned councillor nor the Belagavi City Corporation is willing to take note of this nuisance value which the affected residents are helplessly suffering. The residents have been complaining to the BCC in vain, as it is passing on the blame on a builder for the leakage from the pipe line resulting in the sewage filling up the open drainage lines. If immediate repairs are not done, it will spread and flow further downwards and become a nuisance for many other residents. When contacted, a BCC official said the builder was not willing to take repair work stating that it was BCC’s responsibility i.e., none of them wants to own the baby. But the silence of BCC is shocking as not was willing to take action against those who are directly or indirectly responsible for letting the sewage into public property. The health department keeps issuing press appealing public to maintain hygeine and cleanliness but never advises institutions like BCC to ensure cleanliness of open drains and open sites as a preventative measure against dreaded diseases like dengue, chickenguneia, typhoid cholera, malaria and other communicable diseases. “Who will be responsible if these diseases catch up the affected residents here,” asked an angry resident cursing his fate for being a tax payer to such an irresponsible BCC’s health department. Had such nuisance been occurred in front of BCC Commissioner’s house, how would his staff respond? We expect same response for them, said another. Residents are irked over the attitude of the health department which is aware of the problem but not responding for reasons best known to it. With monsoon clouds becoming darker and thicker, this sewage is bound to get mixed with rain water and enter low-lying areas and only into a bigger breeding ground for dreaded mosquitoes and bacteria. 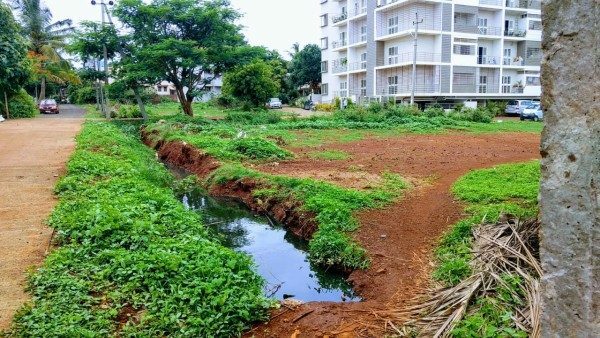 The residents have lost all ideas to make the BCC to wake up from its slumber and lethargy towards civic problems: If this is way they want to develop our Belagavi into a Smart City, only God can save us,” remarked another despotic resident. Yet, these hapless residents looking for atleast one responsible official in the BCC, if not the concerned councillor, to act responsibly before it is too late. Yes it is very much true the city area bad conditions model example, there are so many things in the City Public place and gardens i.e.Shri. Shivaji garden near public tolet drained into the garden near main Street enternce. Thanks for the update posted.